* Create a new message with scan@virustotal.com as destination address of your email. * Write SCAN in the Subject field (write SCAN- if you do not want to distribute your sample to any AV company). * Attach the file to be scanned. Such file must not exceed 10 MB in size. If the attached file is larger, the system will reject it automatically. * You will receive an email with a report of the file analysis. Response time will vary depending on the load of the system at the time of placing your request. 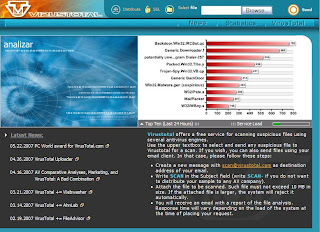 A pretty cool online anti-virus service.